Coprinellus hiascens is a small coprinoid mushroom defined by microscopic features. It belongs to a group of species that feature prominent "pileocystidia"--long cells on the surface of the cap that stick up and can often be detected as fine pubescence with a hand lens (or even the naked eye). 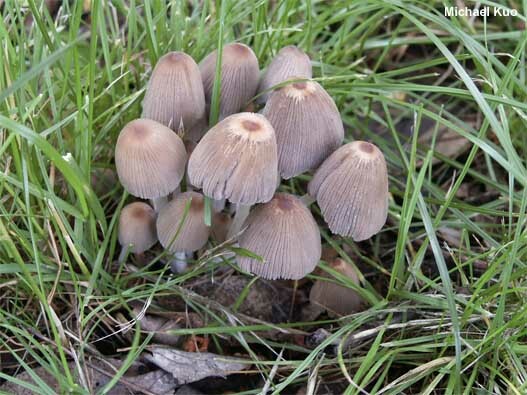 The better known Coprinellus disseminatus also belongs to this group. 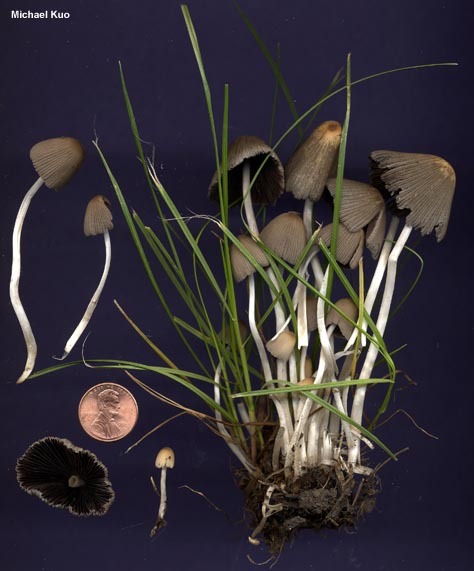 Coprinellus hiascens, however, lacks the inflated veil cells found in Coprinellus disseminatus, and features bottle-shaped cheilocystidia, long and tapering pileocystidia, and elliptical to egg-shaped spores. While DNA studies have tested some of the species in this area of the coprinoid mushroom world in order to ascertain how the (former) genus Coprinus should be broken up to accurately reflect evolution, a study attempting to sort out what the species are has not been done--and such a study is not likely to uphold the current micro-morphology-defined species, in my humble opinion. So I am using the name "Coprinellus hiascens" to refer to what may be a group of species sharing the microscopic features emphasized above. Full disclosure: the pileocystidia of the illustrated collection may not be tapered quite enough to match what is officially described for Coprinellus hiascens. Coprinus hiascens is a synonym. Ecology: Saprobic, growing in dense clusters terrestrially, often in grass; summer and fall. North American distribution is uncertain. The illustrated collection was made in Illinois. Cap: 10-40 mm; conico-convex to planoconvex when expanded; grooved nearly to the center; brownish when in the button stage but soon gray overall, with a brownish center; very finely flecked with whitish veil material (use a hand lens), at least when young; the margin becoming tattered as the gills dissolve. Gills: Attached to the stem or free from it; close or nearly distant; pale, becoming black; deliquescing (turning to black "ink"). Stem: 4-10 cm long; 1-4 mm thick; equal; smooth to very finely hairy or granulated; white; hollow. Flesh: Insubstantial; whitish to gray. 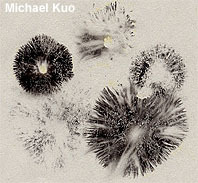 Microscopic Features: Spores 7.5-12 x 4-6 µ; elliptical to ovoid; smooth; with a central pore. Basidia 4-spored; surrounded by brachybasidia. Pleurocystidia absent. 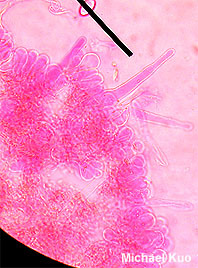 Cheilocystidia lageniform; up to 75 x 18 µ. Pileipellis an epithelium. 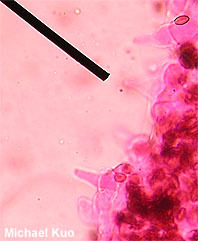 Pileocystidia slender and tapering; lageniform; up to 200 µ long; hyaline; with thin walls. Veil elements sausage-shaped to irregularly cylindric, with more or less subclavate terminal elements up to 15 µ wide. REFERENCES: (Fries, 1821) Redhead, Vilgalys & Moncalvo, 2001. (Saccardo, 1887; Lange & Smith, 1953; Moser, 1983; Uljé, 2003.) Herb. Kuo 06110302.